Lucy Burns, “Lucy Burns,” Histories of the National Mall, accessed April 23, 2019, http://mallhistory.org/items/show/81. As a women's rights activist in the early 1900s, Burns organized political marches and rallies to pressure male lawmakers into passing a Constitutional amendment allowing women to vote. In 1913, she helped organize a suffrage march on Pennsylvania Avenue the day before Woodrow Wilson's inauguration. Burns and Alice Paul formed the National Women's Party in 1917 and continued to fight for women's right to vote. Burns was arrested with other members of the Party after picketing the White House in 1917. While in prison, she went on a hunger strike with Alice Paul to show their commitment to their cause. They won the fight in 1920 with the passage of the 19th Amendment. Lucy Burns was an activist who campaigned for a constitutional amendment granting women the right to vote. She was born in Brooklyn, NY, one of eight children. In 1902 she earned a BA from Vassar College in Poughkeepsie, NY, and continued her studies with sojourns at Yale and Columbia before taking a position as an English teacher at Erasmus Hall High School. After two years, she went to Europe to study at the University of Berlin, then enrolled for a summer at Oxford University in England. It was in Oxford that Burns encountered the Women’s Social and Political Union led by Emmeline Pankhurst, which was fighting for woman suffrage using militant tactics. She joined the British suffrage movement, learning their tactics. While there, she met fellow American suffragist Alice Paul. In 1912, Burns returned to the United States, joining Alice Paul to form the Congressional Union of National American Woman Suffrage Association, which later became to the National Woman’s Party. Their organization was more aggressive than other suffrage organizations in the United States. They organized the 1913 Woman Suffrage Parade down Pennsylvania Avenue in Washington, DC, which was held the day before Woodrow Wilson’s inauguration to draw attention to their cause. Burns and Paul lobbied Congress and led some of the first pickets in front of the White House. 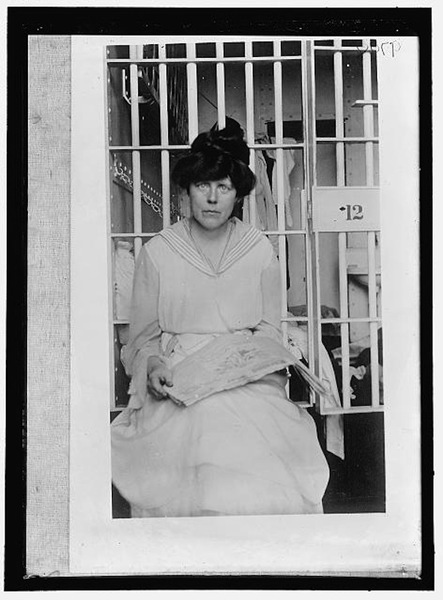 They were arrested for picketing; in fact, Burns was the most-jailed woman suffragist. While in prison at Occoquan, Virginia, Burns and others went on a hunger strike and prison officials force-fed them. Following her release, Burns organized the “Prison Special,” a national speaking tour of suffragists who had been imprisoned. By time the 19th Amendment granting women the right to vote was ratified, Burns was exhausted from years of vigorous action. She retired to Brooklyn, where she helped to raise an orphaned niece and was active in the Catholic Church. She died there in 1966.